On August 15, 2014, Holocaust survivor Hedy Epstein turned ninety. Three days later, she was arrested in St. Louis, Missouri for protesting Governor Jay Nixon’s deployment of the National Guard. Nixon’s action came in response to the unrest in Ferguson after the death of Michael Brown, an unarmed black teenager who was shot to death by white police officer Darren Wilson on August 9. Epstein and her fellow protesters, many of them from the Organization for Black Struggle, gathered in downtown St. Louis not far from where Brown was killed. Their intention was to visit Governor Nixon at his office in the Wainwright Building and request he take steps to de-escalate the situation in Ferguson. The group chanted slogans such as, “Hey, hey! Ho, ho! The National Guard has got to go!” When Epstein and her allies reached the steps of the building, officers and security personnel banned them from entering. The officers asked the protesters to evacuate the premises, but Hedy and eight others remained in front of the building. They were arrested for failure to disperse and given later court dates. 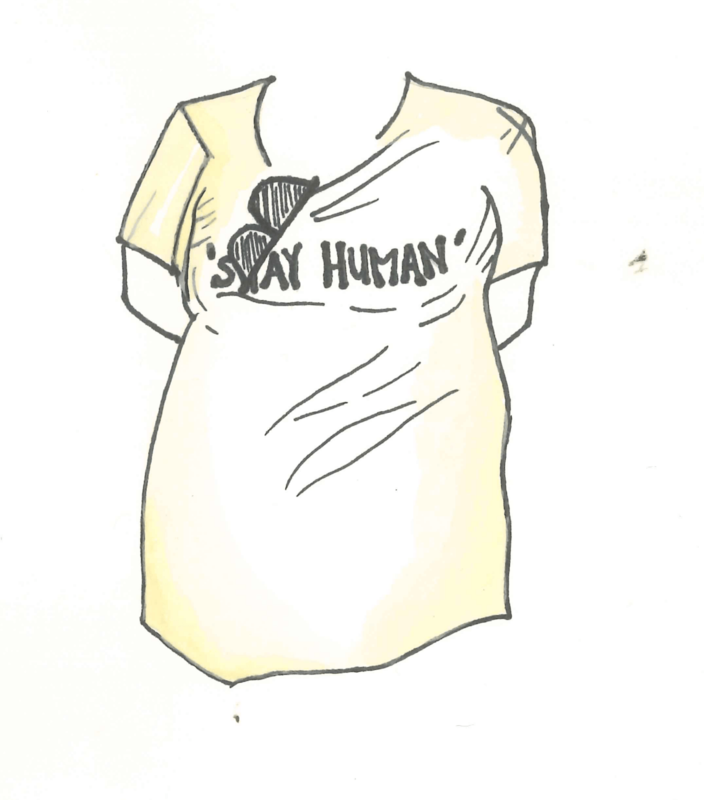 Epstein was walked off site by two officers while wearing a shirt that read, “STAY HUMAN”. Epstein is no stranger to systemic injustice. In 1933 when Hedy was eight, Adolf Hitler came into power in Germany. Slowly but surely, anti-Semitism took hold as Jews were revoked German citizenship, synagogues were burned, and young Jewish men were placed in protective custody. Eventually, nearly every Jew was taken to a camp. Six million Jews and five million non-Jewish individuals died in such confinement. At the beginning of World War II in 1939, Hedy and 10,000 other children were sent to England by train after the country had committed to taking them in. Hedy made it to England, but her family did not. In 1940, her parents were deported to a camp in Nazi-controlled Vichy France. Her parents were separated then eventually both sent to Auschwitz concentration camp in Poland. Her mother sent her a postcard in 1942, reading, “Traveling to the east … Sending you a final goodbye.” She never heard from them again. Hedy gained a school education and found work in England but returned to Germany once the war ended. For three years, she worked on the Nuremberg Medical Trial, which tried the doctors who had led medical experiments on inmates in the concentration camps. In 1948, she moved again, this time relocating to the US to stay with family who had emigrated before the war began. After a few decades of working in the US, Hedy became involved in various civil and human rights campaigns. She fought for the end of multiple wars, for safe abortion services, and for fair housing opportunities in the US. In 1989, she traveled to South America and Southeast Asia as a peace delegate. She also visited the Occupied West Bank numerous times during her career, participating in several non-violent demonstrations protesting the Israeli occupation of Palestinian communities. She has also traveled back and forth between the US and Europe giving talks in German and English on her experiences during the Holocaust. In 2004, Epstein visited the UC Santa Cruz (UCSC) campus to give a talk titled, “The Question of Israel/Palestine”, according to The Jewish Journal online. The talk was sponsored by the women’s studies department, and was critiqued by many publications as a talk that promoted UCSC’s historically “leftist” agenda. The website claims that UCSC has a history of sponsoring Jewish voices who are critical of Israel without also giving a platform for pro-Israel voices. Then, just this March, Epstein was planning to speak on a panel titled, “In Grandmother’s Words” during International Women’s Day in Austria. According to the independent website Mondoweiss, the panel was intended to bring together eight women who bore witness to grave injustices of WWII in order to share their stories with attendees. After slurs like “Israel Hasserin” (“Israel Hater”) were used to describe Epstein in Austrian news outlets, the event was canceled. It was presumed that Epstein’s support of Palestinian freedom incited the comments from the press. As an intersectional activist, it only makes sense that Hedy stood by the Organization for Black Struggle’s (OBS) protest in her own community, as well as in solidarity with the Palestinian community. While many are critical of “leftist” bias in the UCSC’s women’s studies department, the very backlash Epstein has faced for her perspective is likely a key reason as to why she continues to be given platforms to speak about her work. The OBS website asserts that state violence, “…is a manifestation of a system of policing that is unaccountable, out of control and acts from its worst impulses of racism and aggression. It sees black and brown citizens as individual targets and whole communities as collective threats”. It can be argued that this statement also rings true in the Middle East, and on campuses such as UC Santa Cruz. For Hedy, systemic violence as a result of racism is a familiar history. So long as people in positions of power and privilege are excused of their insidious discourse and policies, the injustice will continue.